Impeccable service, excellent cuisine, and an extensive wine list are to be expected at any Bertrand Hug establishment, and Bertrand at Mr. A’s lives up to the highest of expectations. 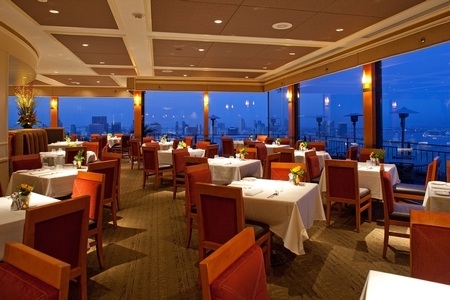 Perched atop a skyscraper on the brink of downtown, the restaurant offers one of the most outstanding dining experiences in San Diego. 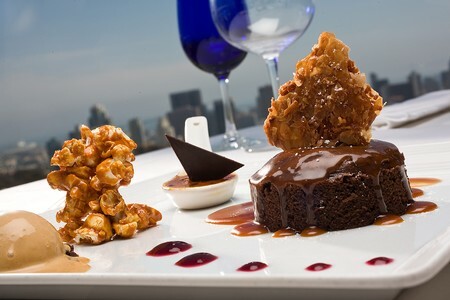 Modern American cuisine elegantly complements the cosmopolitan backdrop, with a menu that offers awe-inspiring “glimpses” of both land and sea. The seasonal menu incorporates the utmost quality meats, fish, and accompaniments, resulting in a fresh and tantalizing selection of dishes. The main dining room offers a premier dining experience, while a more casual, although no less sumptuous, selection of dishes is available in the patio and bar. 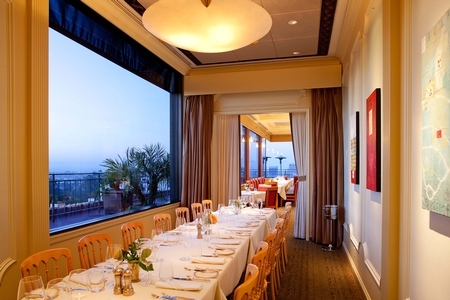 Bertrand at Mister A’s is a veritable fine dining institution in San Diego, synonymous with impeccable service, savory cuisine and most notably unparalleled and breath-taking vistas of America’s Finest City. 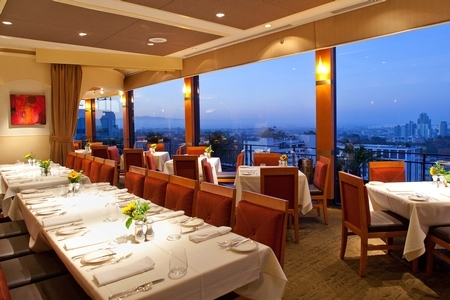 Located on the top of a twelve story building in the heart of Banker’s Hill, Mister A’s provides diners with the unique opportunity of eating a decadent meal with the stunning Downtown and Coronado Island skylines as their exclusive backdrop. Equally distracting, Executive Chef Stephane Voitzwinkler’s French and California-inspired menu combines gourmet, luxury ingredients with an approachable lightness and seasonal freshness. Riding up the spacious elevator up to Mister A’s immediately sets the exclusive tone for our evening. Upon arriving to the twelfth floor, we are immediately guided through the brightly refined dining room, awash in taupes and shades of deep, earthy eggplants, to our table next to the window. Hints of vibrant color, like the red and yellow flowers in dark blue glass vases found at every table and Provençal-style printed china, add a cheerful French whimsy. The view however steals the show: even on this hazy evening, we are able to see clearly all the way to Coronado Island. Outside, guests enjoy signature cocktails and samplings from the restaurant’s Light Menu while soaking up the sunshine on the terrace. Chef Voitzwinkler’s menu is a conglomeration of influences. 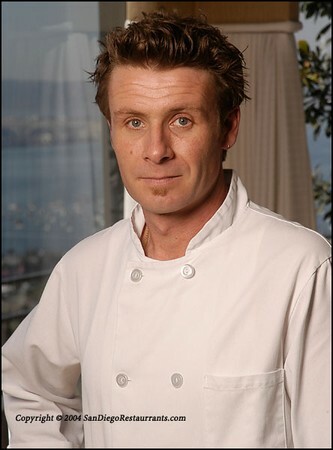 Originally from Alsace, the region of France bordering Switzerland and Germany, Chef Voitzwinkler’s menu draws heavily on the cuisine of his native country. Certain German dishes like spaetzel and choucroute, infiltrate the mostly French and California-dominant menu and reflect the multiculturalism of this unique European region. Additionally, Chef Voitzwinkler is heavily invested in using local, seasonal ingredients, resulting in a menu that is constantly evolving to reflect an emphasis on the freshest of flavors. Bertrand at Mister A’s staggeringly extensive wine collection of over 500 predominantly Californian and French bottles provides ample opportunities of exquisite pairings with Chef Voitzwinkler’s ever-changing cuisine. And through it all, Mister A’s knowledgeable and gregarious staff act as expert guides, offering copious suggestions for delicious pairings to ensure that the dining experience is as complementary and personalized as possible. Our meal begins with the delivery of an amuse bouche of the Macaroni and Cheese, A’s Style. It is served at the top of a tower of nesting dishes, alternating between blue and white that recalls the colors in the Provençal pattern found on the bottom dish. The macaroni and cheese itself is piled in a tiny square dish at the top, permeating the air with the pungent aromas of comté cheese and truffles. Sticking my fork in releases the bubbling richness of the béchamel sauce and forces its tasty surprises up through cracks between the pasta. Each bite reveals new layers of flavors: the earthy truffles hit first followed by the sharp comté and then the crisp saltiness of pancetta bits. It is an excellent start to the evening, full of the promise of decadence and awe. We are next presented a sampling of the Fresh Baked Mussels Provençale. Served on a bed of sea salt and kelp, each of these massive Carlsbad mollusks have been breaded and lightly pan fried in a garlic Pernod butter before being returned to the shell. Pungent with garlic and the anise notes of the Pernod, the mussels prove light and refreshing, despite the potential heaviness of their presentation. Crisp and tender, with powerful flavors and a delicate finish, they are a memorable twist on a familiar appetizer. 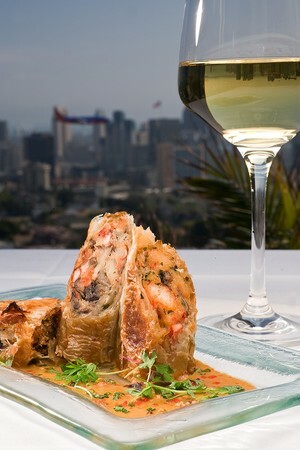 One of Mister A’s best known dishes, the Maine Lobster Strudel, more than lives up to its fame. Large sections of the crisp filo dough-wrapped strudel are arranged architecturally on the plate, displaying their impressive innards in cross section. A tantalizing cognac lobster sauce forms a pool below the strudel for decadent dipping. The crisp dough offers textural complexity to the tender lobster morsels inside, while their buttery sweetness similarly contrasts with the strudel stuffing’s mushroom medley. We are also treated to a small tasting of the Lobster Bisque as a surprising accompaniment, its frothy broth mimicking the deep-bodied cognac sauce with its own hidden lobster nuggets. The Multicolored Beet Salad proves a pleasant diversion from the richness of the preceding courses. Large, round slices of purple, pink and golden beets are sprinkled with candied walnuts, fennel slivers, greens and gorgonzola for a fresh and hearty dish. A crisp, warm goat cheese-filled filo triangle rests in the center, introducing a gooey warmth that acts in beautiful juxtaposition to the salad’s cool flavors. The hint of spice from the horseradish vinaigrette activates the beet’s earthy sweetness. We are served a Fritz Vineyard Chardonnay and a Gunderlach Riesling as accompaniment for our appetizers. Each offer subtle accentuations of the flavors of the dishes :the Riesling’s candy-like honeysuckle bouquet bring out the sweetness in the beet salad and buttery richness of the shellfish while the crisp, grass notes of the Chardonnay complementing the oceanic saltiness and verdant freshness of these sophisticated dishes. To cleanse our palate between courses we are served a pink scoop of Blood Orange and Coconut Sorbet swimming in a delicious sea of Champagne. The tart citrus of the sorbet mingles with the bubbly champagne, tingling the tongue with refreshment. Our palates primed, we are ready to embark on the rest of the evening’s culinary adventures. In the spirit of indulgence that has characterized our meal thus far, we are presented with two “duos” for entrees: the Duo of Roasted Rack of Lamb and Osso Buco and the Duo of Alaskan Halibut and Sea Scallops. Deep, red-blooded scents attract my attention to the Lamb and Osso Buco first, tempting my more carnivorous impulses. The massive mound of Osso Buco, with a sage leaf stuck jauntily in its bone like a feather in a cap, contrasts markedly with the slender, dainty lamb lollipop balancing next to it. The Osso Buco proves so impossibly tender that with the slightest touch of my fork it immediately falls apart and dissolves with buttery succulence. The equally juicy lamb infuses the palate with potent gamey flavors and blends deliciously with its woody rosemary and garlic jus. The bed of green flageolet beans, red piperade and golden fried pommes dauphines adds a rainbow of color and texture for a pleasing, summery accompaniment. The Côte du Rhone blend paired with this duo enhances its heartiness with full-bodied, toothsome creaminess. As much as the Duo of Roasted Rack of Lamb and Osso Buco is a tribute to the delicious offerings of terra firma, the Duo of Alaskan Halibut and Sea Scallops acts as an ode to the bounties of the sea. 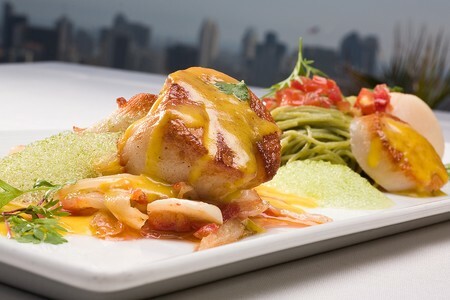 A large piece of golden pan fried halibut rests on top of a bed of shaved fennel between two plump scallops all of which is drizzled with a bright yellow saffron sauce and accented by dollops of garlic foam. The mild, flaky halibut and sweet, buttery scallops, both cooked to mouthwatering satisfaction, are enlivened by the spicy, almost floral exoticism of the saffron sauce. Two nests of green angel hair peppered with red tomato cubes accompany the fish and add color and freshness to the dish. The Tantra Pinot Noir proves a surprisingly exceptional pairing, its spicy notes enriching the flavors of the fish with resonant bravado. In classic French style, we are brought the Artisanal Cheese Plate to help guide our taste buds toward a satisfying conclusion. Generous pieces of Humboldt Fog, Trésor de Normandie, Tête de Moine and Taleggio cheeses offer a fast education in the complexities and pleasures of fromage. While the creamy, camembert-like Trésor de Normandie seduces with its richness and the Tête de Moine and Taleggio entice with their pungent, brawny aromas, it is the Humboldt Fog, and its tart, milky decadence, that proves impossible to resist, and has me and my dining companion scooping up every last bite. Our evening ends on a sweet note with the Blood Orange Tartelette and the White Peach and Brown Butter Torte dessert special. The Blood Orange Tartelette is dominated by its fluffy meringue top, which blends together with the tart blood orange for a light and airy treat. A pink rhubarb “soup” delivered in a shot glass and topped with unsweetened cream cheese foam, is a unique and intriguing accompaniment, amplifying the Tartelette’s flavors. The unanimous favorite, however, is the White Peach and Brown Butter Torte. Served with a puckering raspberry coulis, it blends fruity tartness with an almost shortcake-like subtle sweetness that makes our taste buds dance. The house made caramel ice cream pairing adds additional richness to this dreamy confection, whose flavor memory lingers long after I leave the restaurant. From start to finish, a dinner at Bertrand at Mister A’s promises incomparable indulgence. 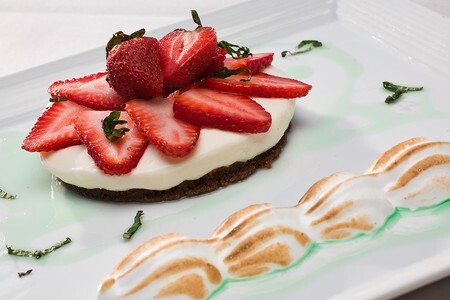 The stunning view, Chef Voitzwinkler’s impeccable cuisine and the attentive staff all ensure that diners at Mister A’s are treated to an unrivaled experience of full-sensory pampering. Main Dining Room | Lunch 11:30 a.m. - 2:15 p.m.
Main Dining Room | Dinner 5:30 p.m. - 9:45 p.m.
Bar & Terrace | Happy Hours 2:30 p.m. - 6 p.m.
What is the fee for valet parking at your restaurant? Valet parking fee is $10 for dinner and $2 ($16 max) per every 30 minutes for lunch. What floor is the restaurant located on? Is Bertrand at Mister A’s within walking distance to the San Diego Symphony Orchestra building? The distance is a little over a mile. It’s about a 20 minute walk, or a 6 minute drive. Does this restaurant have live music? No, Bertrand at Mister A's does not feature live music. What kind of view does the restaurant have? Fashionable evening attire is acceptable for dinner. For gentlemen collared shirts and slacks are appropriate. For ladies a dress or blouse with a skirt or slacks are appropriate. Jeans are permitted, provided they are not ripped or torn. No shorts are allowed during the evening. Beach wear, gym attire, athletic apparel, hats, flip flops, and open-toed shoes for men are never permitted. Is Bertrand at Mister A's open for lunch? Yes, Bertrand at Mister A's is open for lunch on Monday through Friday, from 11:30am to 2:15pm. Can I have flowers delivered to the restaurant for my reservation? Yes, you can have flowers delivered no later than 4pm the day of your reservation and the restaurant will set them up at your table. Be sure to include the name of the reservation with your flower delivery. What is parking like at your restaurant? There is street parking and valet parking available. Yes, Bertrand at Mister A's does have a full bar. Does the owner of Bertrand at Mister A's own any other restaurants? Yes, Bertrand Hug also owns Mille Fleurs. Are guests under the age of 18 permitted to dine at Bertrand at Mister A's? Does happy hour run any later than 6pm? No, happy hour is only served Sunday through Thursday in the bar and patio areas, and runs from 2:30pm until 6pm. The Happy Hour menu can be found in the Menus section of Bertrand at Mister A's page. (V) Denotes vegetarian upon request. Pricing does not include tax or gratuity. (V) Vegetarian Upon Request. Pricing does not include tax or gratuity. 20% gratuity will be added to parties of 8 or more. 1/2 dozen / yuzu granit? Available Saturdays and Sundays from 10:00 a.m to 2:00 p.m. This is a sample menu only. Prices and availability may be subject to change. Happy hour is served Sunday-Thursday 2:15 to 6:00. Served in Bar or Patio Only. $9.50 for each dessert for lunch. $11.50 for each dessert for dinner. Suggested wine pairings available for each. Pricing does not include tax or gratuity. This menu is available on the outdoor patio and bar area only Monday - Friday from 11:30 a.m. to 10:30 p.m. and 5:30 p.m. to 10:30 p.m. Saturday - Sunday. Pricing does not include tax or gratuity. Once we reached the top of the building and stepped out of the elevator, we could see without a doubt why Bertrands at Mister A's was such a talked about experience. The view was panoramic and was absolutely stunning. We arrived at 5PM when the doors opened. We were not able to be seated until 5:30PM but we didn't mind. We sat at the bar and watched as the sun began to set and watched as the airplanes came and went from the nearby airport. Now for the dining experience ... we started with a full ounce of Beluga cavier which came with all of the traditional side items. Expensive but delicious! Next, came our entrees of the Salmon and the Seafood Paella. Both were prepared wonderfully with the richness of the Salmon and the robust Spanish flavor of the Paella. We topped off our meal, though painfully full, by sharing a Creme Brulee, my personal favorite. Light and creamy, it is a perfect dessert for those with a full stomach! Overall, the experience was wonderful and the restaurant is recommended to even the pickiest of clients. I sent my boss and another guest to Mister A's. He reported back that the food was terrific, the atmosphere was exceptional and the service was superior. I was very pleased, as his preferences are very discerning. beautiful view, good food and great service. I went to Mister A's for my senior prom dinner and I had the best experience! The view was magnificent and I enjoyed every minute there. We were seated immediately as soon as we walked in, and our table was right next to the window with the view of the downtown skyline. We ordered a main entree, which arrived within 15 minutes of us ordering. We also had dessert; I had the best creme brulee I have ever tried. The service was fantastic, the servers were so poised and nice. The food, presentation, service, and view are all beyond expectations. An overall excellent experience that I look forward to. Unbeatable. The food was fabulous, the wine list was excellent, and the service was spectactular! The staff were all extremely accomodating and attentive. It was so great we went back the next night as well. great service. amazing view and the food and drink all well prepared. this was my first, but most certainly not my last time to mister a's! thank you. Bertrand's Mister A's is the finest restaurant in San Diego - period. The food, ambiance, view, service - flawless. Very expensive, buy the experience in something you will remember for ever. A perfectly chilled bottle of champagne, 5 courses - all heaven. Dining at Mister's A was simply the best dining experience I've ever had. Our waiter was very knowledgable about all the dishes, provided us with great recommandations, even took the time to offer cooking tips and came out on the balcony with us to take pictures. The food was delicious, although the portions tended to be quite small that we ended up ordering a 2nd appetizer after our entrees along with dessert. The view was breathtaking. We were even offered a choice of which view we preferred. Our concern was that since we're a young couple that we would not be served as nicely as the others, but we have no compliants, only fond memories of our experience. I only wish this place wasn't so expensive. The food and wine are really good. Don't skip appetizers because the entree portion sizes are small (but well presented). The view of San Diego is wonderful as long as you're not seated facing the airport. I took my mom to this restaurant for a nice night on the town. We loved everything from the appetizers to the desserts, and the service was excellent. The wait staff are very pleasant and are always there without being distracting. I recommend the dessert sampler. It was heavenly! My husband and I had one of the most memorable dinners ever at Mr A's. The appetizers, entrees and deserts we tried were wonderful, and the staff was superb! After dinner, we enjoyed taking a stroll on the balcony and enjoyed the view - very romantic. We will definitely be back - and can't wait to show off Mr. A's to our friends and family who come to visit. Always at the top of our list!!! Check in and ask for your Maitre ' D Mr. Jerry Cappazelli. 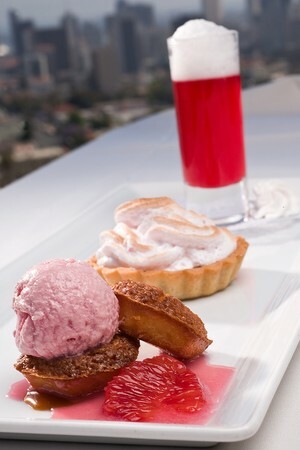 Then sit back and behold a fantastic journey in to great food and exceptional service. Bon Appetite !!!! P.S. the crab bisque is devine, add a little sherry and heaven awaits you! Went to Mister A's for the first time this past Tuesday night (I was visiting San Diego). From the moment I got off the elevator, the staff was nothing but amazing. We were greeted warmly, and quickly ushered to a wonderful table next to the window - with an amazing view over San Diego. Our server was delightful, with great recommendations from drinks to appetizers to main courses - and the service was impeccable. This is the finest of fine, folks. The food was just incredible. EVERYTHING we ate and drank was just spendid. It was a perfect evening at a near perfect place. Yes, it was expensive, but dang was it worth it. Mister A's is top notch. It was my partner's birthday and they brought a special birthday dessert for him that was wonderful. I can't recommend Mister A's enough. If I had a tiny complaint, the tables could be a little further apart and the decoration needs to be a little less stuffy. But by all means - go to Mister A's. We can’t say enough good things about our dining experience. The service, food and view were all excellent. We had requested a window table in the comments section for our reservation and made a note that we were celebrating our 5th anniversary. Not only did they give us a window table to enjoy an amazing view and sunset, during dessert they brought us a special dessert plate with Happy 5th Anniversary written in chocolate. We will absolutely go back. Splendid evening spent with a great view and fabulous food! The waiters were very attentive and friendly. It was a very romantic time with the dim lights and great scenery. I would definately go back to this restaurant!!! The place as well as the service was very impressive. From the time we stepped out of the elevator, to our very last drop of wine. It was the perfect date. I took my mother to Mr. A's for her 78th birthday and the experience was exceedingly memorable. The food was wonderful and of high quality. The service is superb. The waiters, there assistants and others, are attentive and cognescent of your needs. I would recommend this restaurant to any person who wants an intimate setting with a phenomenal view and excellent food and service. Everything was great, the view, the food, the service,etc. I really recommend this place and I'll definitely come back again. We had Andrew as a server, he was probably one of the best we've had in a long while. My gf couldn't decide what to drink, so he brought out samples and eventually sugguested the perfect drink for my girlfriend (new to drinks) They looked past our young age, and treated us like royalty. Definately will be back. Anyone who has been here before probably already knows this, but this is definitely the best restaurant in San Diego. I went there the other night with my girlfriend and it was just unbelievable food and service. Keep up the great work! I made a reservation for last Saturday night at Mister A's for our one year anniversary. The experience was absolutely wonderful. From the first moment we were seated and kindly greeted by our server Brad, the night unfolded into one of the best memories in our lives that we will cherish forever. The view overlooking downtown San Diego was breath taking. We were presented with impeccable care by the staff the entire night and no one treated us less diligently simply because we were younger (believe me, we have encountered servers who would rather take more care of the seemingly more prominent, mature diners next to us). The food was exquisitely prepared with the freshest seafood (my halibut was delicious, the asparagus was crisp and flavorful) and his Kobe beef was grilled to perfection. At the end, the thoughtful host presented us with a plate of fine chocolates with 'happy anniversary' written in chocolate on the edge of the fine china plate. It was a wonderful and perfect surprise to end our magnificent night. I must add that everyone was so friendly at Bertrand; even the gentleman at the valet was very polite. Another couple who just dined at Bertrand wished us a good night when they walked by us. Lovely atmosphere and fine cuisine just makes everyone feel delightful. Thank you Betrand at Mister A's. It is now one of our favorite restaurants. Great location to end your day and have a nice dinner food was excellent as well as the service. Highly recommend the scallops and tempura lobster very tasty. My friends and I had a great time. We felt like royalty when we were at Mister A's. The service was top of the line and the food was amazing. We ended up getting the best seat in the house, on the balcony right at the corner of the building. The view of the sky line was beautiful. There were two heaters by us so we were very comfortable. And to top it off when we finished our desert we got to watch the fireworks show at Sea World from our table. It was great! If you are trying to impress someone, this is the place to go. Great place to eat or just enjoy a great cocktail! I always start the evening in the patio or the cozy bar at Mister A's. The staff is top notch i can't say enough about the impeccable service they provide. Of course the view we all know how amazing that is, if you don't well you're missing out. The food is also some of the best around, try the lobster streudel for starters and then follow it by the amazing slipper lobster and scallops, its to die for. I reccomend this place to anyone who wants to have a great time and also enjoy wonderful drinks and food. We enjoyed a fantastic dinner at Mister A's during our stay in San Diego. I highly recommend it ! Love this place. Most incredible service of any restaurant in san diego. Wow, if you want a dinner to remember go to this place. And the view is like no other, over looking all od San Diego. The Bartender made me the best blueberry martini it was to die for, the were extremely friendly and attentive. We ended up having dinner at the bar and it was perfect, I think his name was Danny or Manny but hes was amazing and extremely nice. I hope to be back soon. Great Place! I live in North County, and I always look forward to picking up friends at the airport and heading to Mr A's for a meal. I've read the reviews about the stuffiness and self-importance...but to be honest, haven't found that to be the case. I have always felt welcomed and pampered. I have enjoyed every visit, from the view to the food to the attention....I just love it! The dinner was perfect in every aspect. We sat at a table next to the window in the evening and the view was amazing. It out did any of the best postcards of san diego. I had the sea bass and scallop dish, it was amazing. my girlfriend and mother had the spinach gnochi and it also was amazing. My father has the ribeye. The meat was soo flavorfull, juicy, and tender. The server and table attendant were also great, our glases never were empty. Also if you go, the mac & cheese appetizer is a must. Mr. A's is a guarenteed perfect dining expierence. The B @ Mr A's...perfection. If you want to show class, Bertrand is the only way to go...that is unless you want to go to his other restaurant. The view, the food, the drinks are world class! All I can say is try it for yourself and don't take my word for it. The best Restaurant in San Diego. This restaurant is amazing, everything about it is perfection. The ambiance is relaxing and romantic. I love that it's tucked away but in a great location at the same time. If it is warm enough sit outside at night and look at the city lights. You can watch the planes landing as well while enjoying your meal. The food is outstanding, wine is great and dessert is wonderful. My favorite restaurant in San Diego! The service wad excellent, excellent food, good price amd a very nice wine list. The waiting staff was extremely helpful and polite. We took out of town guests to this restaurant and they absolutely loved it. The food is excellent and the view of downtown San Diego and the airport is fabulous. Can't beat this place for a very special occasion. Bertrand's does not disappoint. Waitstaff is solicitous but not overpowering. The menu offers a wide variety of dishes to appeal to just about any palate (including several vegetarian dishes). 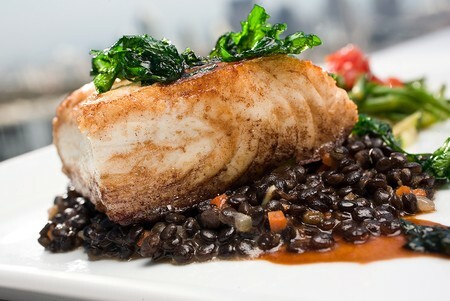 The dishes are presented in an eye- and palate-pleasing manner. The food is delicious, flavorful, fresh, and the portions are just the right size. All this, and the most amazing view - well worth a visit (or two). Wonderful place for a special occasion. Parking was abundant, and the view was magnificent. The menu is a bit intimidating but the staff was very knowledgeable about the items. Food was cooked to perfection. Should have brought my own wine, although impressive, the wine list is quite expensive. Stunned my girlfriend when happy anniversary came written in chocolate on a free plate of cookies. I loved the persoal attention of the waiter and the presentation of the meals. I also loved the tast of the food. The entres were cooked just the way I asked and served hot. The view was incredible and the atmosphere made me feel special. If you've never been to Bertrand at Mister A's, you've gotta go. If not for the food, the view. However, the food matched the spectacular view. The salmon was seriously the best I've ever had. It was so moist it melted in my mouth and the mushroom soup was so creamy, but not overly rich. The whole experience was one to remember and I can't wait to go back and try one of their other dishes. I highly recommend going. Susan L.
The food is outstanding- the presentation, the portion, and the taste. Restaurant atmosphere is relaxing and classy.Staff are all professional and well mannered. Price is just right with the overall service. My two daughters, Dana and Jodi and granddaughter Leanne decided to hire a limo and dine at Mister A's prior to attending the Legally Blonde theatre production at the Civic Center. I had eaten there several years ago, but the girls had not experienced it. It is a perfect place to dine before attending one of the city's events. We were surprised when Mr. Bertrand stopped by our table and felt honored by his comments and presence. The food was out of this world delicious and prepared in just right portions. 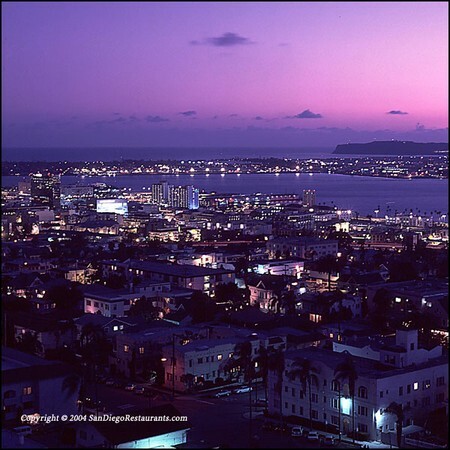 The atmosphere including the beautiful view of America's Finest City is something to see. Personnel were not intrusive but were right there catering to our every request. It could be compared to grand dining at home with one's own personal servants. I was so impressed with the service. I think Mister A's is a place where all people should have a chance to dine at least once in their lifetime. Loved it! It really set the stage and offered us a great send off to theatre. This is a lovely restaraunt with amazing views - a beautiful sundeck for outside lunch. Very upscale, particularly for San Diego - please dress up a little...jeans don't look so nice. I have been to many restaurants in my life, but Bertrand's is #1 on my list. Everyone there made it their personal goal to satisfy us and they excelled at it. The food was a breath of fresh air in this world of common foods. I had the lamb cooked to the chef's perfection. The perfect flavors of fat and meat mixed with wonderful veggies made it a perfect meal for my pallet. I topped it off with dessert which was wonderful almost heavenly. I want to thank everyone there for the most wonderful experience in dinning. One of the best restaurants in San Diego. We enjoyed the food, view, service, and restaurant layout. All service representative were courteous and professional and well dressed. My wife and I celebrated our 29 year anniversity at the restaurant and had a wonderful evening. The service, food, wine and view were all excellent. I was in town on business, we are from Pennsylvania, choose to celebrate at Mister A's. Great choice and overall great evening. We would return and highyl recommend the restaurant. Excellen place for a anniversary dinner or birthday. Excellent place for a anniversary dinner or birthday. its sure the best place in town. The service was great, fast, clean, best view in town. i will recommend this to any one who wants to experience the best in san diego. 4 diamonds goes to the food, to the place and to the service. The food, the view, the service - everything was outstanding! Last time we were in Mister A's for our anniversary. And the staff made our visit special. My wife and I had a great experience for date night while visiting from out of town. The great food and service were matched with an amazing view. It was fun to watch the planes fly in at eye level! Last Wednesday I had the fortune to dine once again at Bertrand at Mister A's, with this, my forth. It has always been a pleasure to my senses. The exact amount of food, with the perfect taste. The service is unique and the waiters do understand what you are looking for. Their recommendations have always been a hit. I can't imagine spending some days in San Diego and not visit Bertrand. I was very impressed with the service, the food and the beautiful view at Bertrand's. Wonderful experience! San Diegans are spoiled! The climate is perfect 288 days a year! Never too hot or too cold. The city is friendly, the restaurants are top rate. But a few places distill the magic of San Diego into its essence. Bertrands at Mr. A's is one of those. The view is incredible, high on a hill overlooking the city, at eye-level with descending airliners, which you can then watch land at the charmingly small airport. Get your camera ready! One could easily accept food that was just "good," well worth the not-extravagant yet not-economy price. But the fact that the food is also seriously wonderful makes Bertrands a place that you HAVE to go to if you visit San Diego. I spent a Sabbatical year in San Diego and became a "regular." It didn't take long for Jerry to get to know me. He always had something new and wonderful for me to try. He found out that I loved vegetables, so extra ones mysteriously appeared whenever I came to dine. He knew my passion for good desserts, so he always had a new one for me to try. Entrees were always memorable. Best Swordfish I ever had. And I had it again and again! Consistantly excellent! Enough said! It was simply romantic. We sat outside looking over downtown San Diego. The view was so perfect. They had outside heaters which made the temperature so comfortable. The food was delicious. It's an experience that if you live in San Diego you have to enjoy. We will absolutely visit again. We let them know in advance that it was our anniversary. The hostess seated us at a table with a wonderful view and the waitress greeted us with "Happy Anniversary!". The service matched the quality of the food and the wine recommended by our waitress was excellent. This is the second anniversary we've celebrated at Mister A's and it won't be the last. I took my wife to Bertand's for a surprise birthday dinner with friends and the evening was outstanding. The service was wonderful, the food delicious, and the atmosphere special. We'll definitely be back to this special place. I had a great night and I was very pleased with the service. It was my 5th wedding aniversary and the night went great. A really lovely, relaxed yet attentive place to be. The whole experience was perfect from beginning to end and the price wasn't too scary either! We had a wonderful experience. The service was about the most friendly we have ever had. It was like going to a friend's house! The food was excellent and the view at susnet was outstanding! We had a group of 12 and they accomidated us all with a wide variety of selections. Food and waiting was excellent only to be surpassed by the view. I travel frequently on business and pleasure. 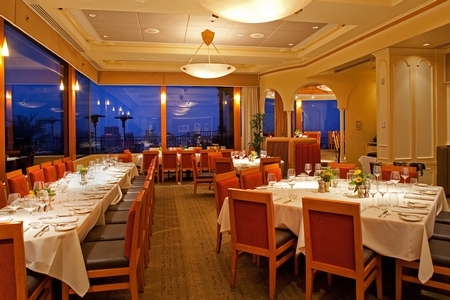 Great overall dining experience -- great venue -- make it part of your San Diego visit. A very, very good restaurant with excellent service. Five out of five. Having a bit of trouble finding the elevator to take you up to the dinning level makes sense now after you enter this fabulous restaurant: I'd want to keep it a secret too! Almost immediately my girlfriend and I were seated 30 minutes prior to our reservation with our waiter only seconds shy of beating the host to our table to situate us. The view: Amazing. The Lighting: Perfect. The food: exquisite. The Service: Outstanding. If you want to impress your date come here; you may find yourself paying more than you are comfortable paying but its positively worth it. The evening was excellent from start to finish. We were escorted to our table promptly and the view was spectacular. The menu choices were excellent; our waiter was helpful with his suggestions, and everyone in our large group enjoyed the experience. Thank you! What a wonderful choice for a sumptuous Friday lunch. The food was prepared fabulously and the service was truly impeccable. This restaurant should be called "Mr. A+". In fact, the word "restaurant" doesn't even come close to describing the entire experience. I can't wait to go there again. WOW! The pride of San Diego eateries! This was our first visit to Mister A's. We have heard about it since we moved here 15 years ago, and finally got to it! We absolutely loved it from the parking, onto the escalator and into the lovely restaurant with it's "to die for " views! Our waiter was superior, the food superior, the whole experience was superior. We will be be back soon, with or without a special occasion. if you can only go to one resturant in San Diego, then this is it. The view is amazing and watching the planes pass by is a treat! The fine dining experience is filled with flair and the service is 5 star. Highly recommended. 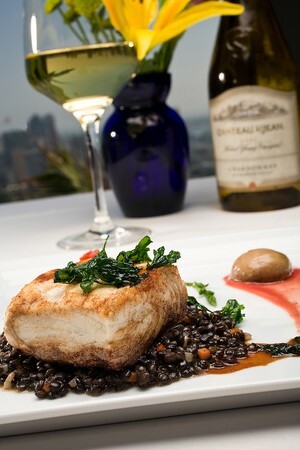 This was our first visit to Bertrand's in San Diego and one of the most exciting eating experiences we have ever had! From the receptionist to our waiter, the young man bringing water, the dessert and meal were outstanding! Plus where can you find a view like this!!!! Please bring this dining experience to Butte, Montana! We had dinner for my 60th birthday and it was the best ever. Great staff, food, view and company. Bertrand at Mister A's made it a wonderful celebration, low keyed and just what I wanted. Very romantic place to take a date. Mac & Cheese is incredible. Ask the wait staff for suggestions. Our waiter suggested a different dish for me based on my original choice and it was incredible. Our waiter was great. Can't remember his name. There's no other restaurant to compare. The service and food was outstanding, I will be going back! I absolutely have no complaints with the place. My wife and I wanted a quiet, fancy dinner with a romantic atmosphere and we were not disappointed in the slightest. Be prepared to spend, but be prepared to be blown away by the service and quality of the overall dining experience. Thank you for a perfect evening! The reviews do not do Bertrand at Mister A's justice. Easily one of the best restaurants I have been to, I will definitely be going back. 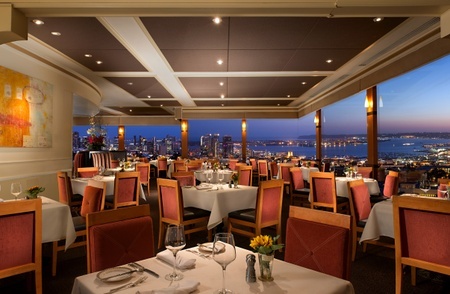 If you want an excellent meal with outstanding service and romantic ambience overlooking San Diego harbor with all the twinkling lights of the city, Bertrand at Mister A's is the place to go. It is my favorite restaurant in the city! We had a lovely time. The view was spectacular. The salmon was great and my husbands prime beef short ribs melted in your mouth. It was a little pricey, but the food was delicious. The creme brulee was exceptional. Excellent waiter staff. The only thing we didn't really care for was the garden salad dressing. It was bland. I celebrated my birthday, very good restaurant, very romantic and awesome view, i would recommend it to my friends and family. This is the best place to take someone special you want be disappointed!!!! I could sit and look at the view all day. The food was excellent. We had Kobe beef burgers cooked perfectly medium-rare and truffle fries. Those were addicting. The service was excellent also. Our dinner at this restaurant was great. All of the food presented at the table was delicious. The restaurant has a very polite staff and we were well cared for from the time we stepped off the elevator into the lobby until we left via the elevator after our dinner was over. We were seated at the back of the restaurant near an open door by an outdoor patio where a private group was gathered for an event. The large group was a bit of a distraction until they left the patio area and went into their private room. Once I asked the wait staff to close the patio door the cool outdoor air and noise was not a factor. Our experience was not negative because of this, but it is worth noting that not every table seems equal in placement at this establishment. The restaurant has beautiful view, great services and food. For a special dining experIence this exceeded our expectations. 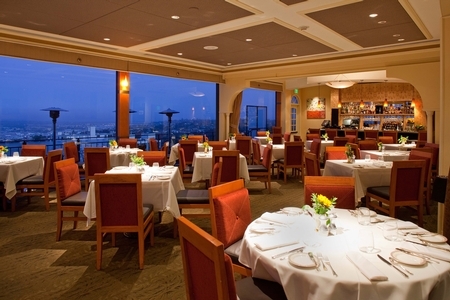 The view, the service and the food were excellent and we highly recommend it. Spectacular ambiance at this 12th floor restaurant. The service was excellent. The food would be rated at the highest level. Whenever I visit San Diego I always have dinner at Bertrand at Mister A's and once again the meal was outstanding, service fantastic and views breath taking. Very nice Ambiance and helpful people working there. Loved the food and view very much. When I return to San Diego I will return! Having eaten on consecutive nights at Bertrand's and Truluck's it is easy to say that Bertrand's is the BEST. Everything, from arriving to the end of the meal was great. Service, food, ambience.the meal just kept getting better, beautifully prepared and presented and outstanding flavors. Great wine list and selection of after dinner drinks too. Bertrand at Mister A's is my new favorite place to eat in San Diego, and is right up there on my list of top places to eat anywhere. The dining experience combined with the increadable view can not be matched.